Bali Water Sports and Dinner Tour is a Bali Combination Tour Package in Bali Islands to Enjoy Water Sports Packages activities and continue having fresh seafood dinner at jimbaran bay beach. Bali Water Sports and Dinner Tour will enjoy visiting Bali Water Sports provider for having Water Activity package such as Parasailing, Donut Boat, Glass Bottom Boat and Turtle Islands Tour and continue the tour to visit Jimbaran Bay beach for having romantic and delicious fresh seafood dinner, after finish the dinner we will drop you back to your hotel with bring wonderful memoryThe Bali Water Sports and Dinner Tour will bring you to the wonderful memory with two different experiences as the feature of this package. 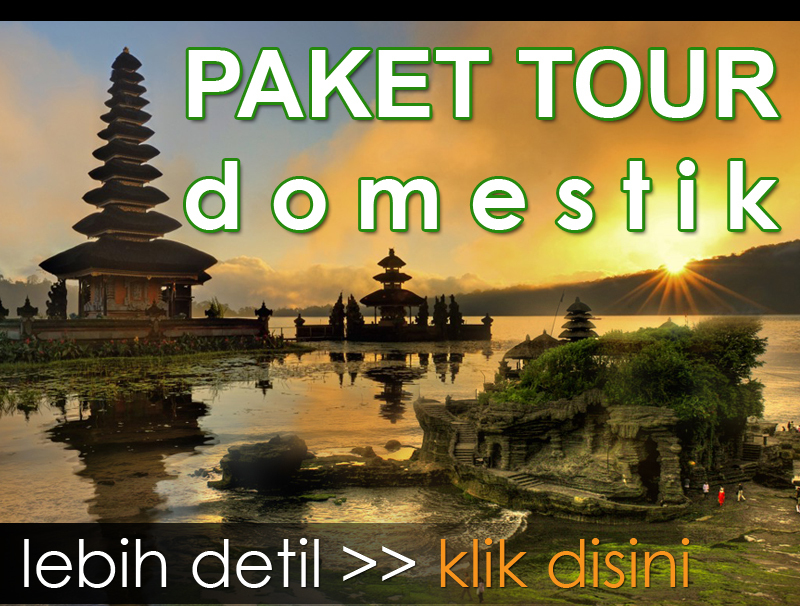 Our professional Bali Tours Driver is always outstanding offer our best services to keep your convenience trip along with private full air-conditioning car transfer to complete your enjoyable on Bali Water Sports and Dinner Tour. Below is short description places of interest will be visit during Bali Water Sports and Dinner Tour. 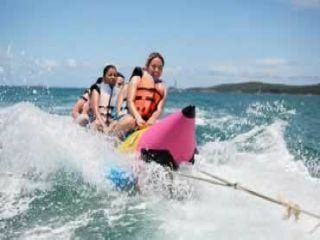 Bali Water Sports is experience to enjoy marine activities with full of fun and excitement. Enjoy your Marine recreation of Bali Water Sports package such as: Parasailing, Donut Boat, Glass Bottom Boat and Turtle Islands Tour, Perhaps all of us love the adventure of water, here you can do water activities that have been provided and do not doubt they’ve experienced so all you get a warranty. Enjoy this wet adventure for your enjoyment. Is good choice if you like Water activity and wet adventure in the beach. 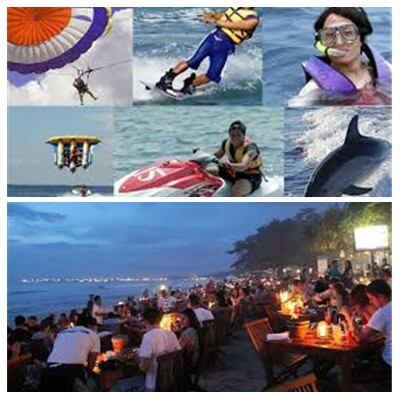 Never missed the exicetement Bali Water Sports and Dinner Tour during your holiday in Bali islands. Jimbaran Beach is beautiful beach with white sand and located in the southern part of Bali with white sand unfolding along the coastal. Jimbaran is famous for fishing village due mostly pople live here work as a sailor due near with beach and now is getting famous for fresh seafood dinner with different taste from other seafood. 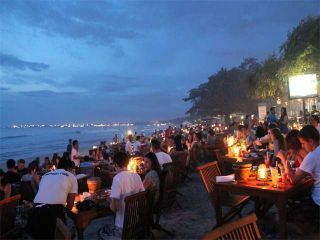 There are plenty of cafes offer delicious of seafood Dinner with breathtaking view of Indian Ocean. It is served right on the beach with beautiful table set up apposite to the ocean. Is amazing delicious fresh seafood dinner with amazing Balinese dance performance during the dinner.